Where to go: Itty Bitty Public Skating runs Monday and Thursday mornings from November through March, 10-11:30 a.m., at Leddy Park Arena in Burlington. There's no age limit, though the program is designed for the preschool set. Call 865-7558 or visit enjoyburlington.com/leddypark.cfm for more information. Prices: $8 per family or $70 per punch card (worth 10 visits); $1 per person for skate rentals. What you need: Kids should wear winter coats, snow pants, hats and mittens. A helmet that covers the back of the head and forehead is recommended. Know before you go: Baby carriers aren't allowed on the ice. However, strollers and pull sleds for younger children are permitted. The bathroom is located on the opposite side of the arena, so take a potty trip before you lace up the skates. Cavernous Leddy Park Arena feels strangely quiet on a wintry Monday morning. No clacking of hockey sticks. No pucks ricocheting off the fiberglass. But follow the long pathway underneath the bleachers to the small studio rink at the end of the building, and there's action of a different sort. The rink — located in Burlington's New North End — is littered with colorful plastic balls, action figures, soft foam blocks and tub toys, all small enough to fit into the mittened fists of a preschooler. The toys are a key part of Leddy's Itty Bitty Public Skating program, which introduces young children to skating. This morning, a dozen budding skaters under 6 navigate the ice, trying to pick up the scattered toys. Each uses a rudimentary but highly effective tool: two stacked milk crates that have been bolted together. 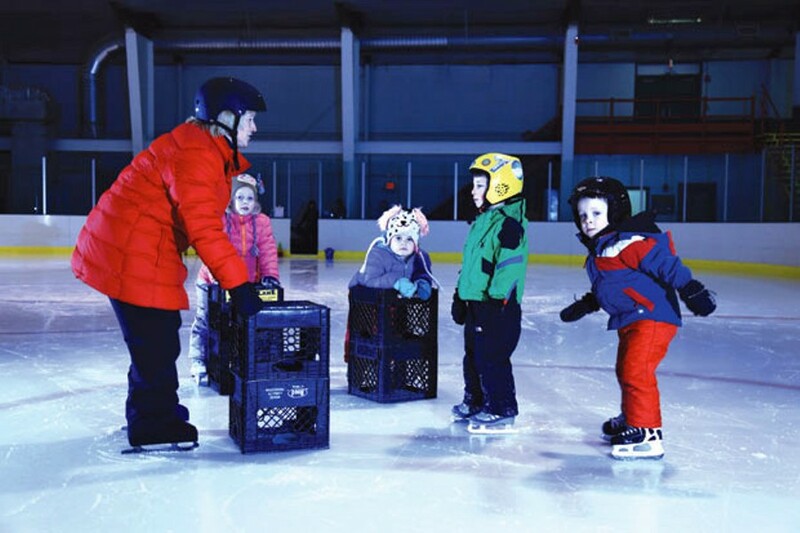 The crates are the ice-skating equivalent of training wheels, allowing kids to cruise around with ease until they're ready to skate independently. The crates are also a handy platform for the toys, which the kids scoop up and drop into beach buckets. When their buckets are full, they hand them to skating instructor Julie MacDonald, who scatters the loot back over the ice. According Kathy Knauer, Leddy's arena program manager, Itty Bitty Public Skating started eight years ago as a way to make young children feel comfortable on the ice. It has done just that for my own kids. I started bringing my daughter, Mira, last winter when she was 4. Always the cautious one, she initially held on to the milk crates for dear life. Most of our time was spent skating in tandem, with me supporting her under the armpits, a technique MacDonald recommends for timid skaters. Mira gradually gained confidence, and after about six sessions last winter and one this year, she abandoned the milk crates and began skating on her own wobbly legs. Meanwhile, my daredevil son, Theo, who is almost 3, took to the ice this year like a mini Gretzky. His second time in skates, he was full steam ahead, barreling across the rink with the crates in front of him, begging me to chase him. MacDonald, who's been teaching skating for 32 years, circulates from family to family during skate sessions, doling out encouraging words and tips. When one father explains his child is ready to pack it in after just minutes on the ice, MacDonald recommends a snack break instead. But, she advises, leave the ice skates on while the child is munching. "Once you take those skates off, it's over," she says. MacDonald has instructed kids as young as 16 months and says it's not age that determines readiness, but a willingness to try. "As long as you can find skates to fit their tiny feet and as long as they can walk," she says, there's a place for them at Leddy Park Arena.